This letter deals with the problem of bounding all solution sets to systems of nonlinear equations where nonlinear terms are described by set-valued functions termed piecewise-trapezoidal functions. 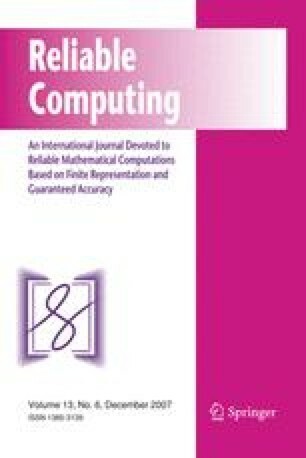 Such a problem is important in the numerical computation with guaranteed accuracy and in the analysis of fluctuated systems (such as the tolerance analysis of electronic circuits). It is shown that the proposed algorithm could find all solution sets to a system of 300 piecewise-trapezoidal equations approximately in about 30 hours using a 360 MHz computer.